Laut einem Bericht von Motor Trend, hat Ford jetzt bekannt gegeben, für das kommende 2010 Ford Mustang Modell, den bekannten 4,0l V6 Motor zu ersetzen. Der neue wird durch eine Twin Turbo EcoBoost V6 Engine ersetzt und wird erstmalig in einem getunten Ford Fusion gezeigt. Der Motor kann Leistungen bis etwa 415PS produzieren und hat dabei das gleiche Drehmoment wie sein großer V8 Bruder. Grund für diese Weiterentwicklung sind neue Gesetze, welche 2020 eine 35mpg Beschränkung mit sich bringt. Weiters wird der alte 4,6l V8 Motor durch einen neuen 5,0l V8 ersetzt, welcher erstmals in einer limitierten Auflage beim aktuellen Mustang GT, gegen Ende 2009, Verwendung finden wird. Genaue Leistungsdaten sind noch nicht bekannt, es sollen 315PS sein, allerdings geht man eher von einer Leistung von 325 bis 350PS aus. 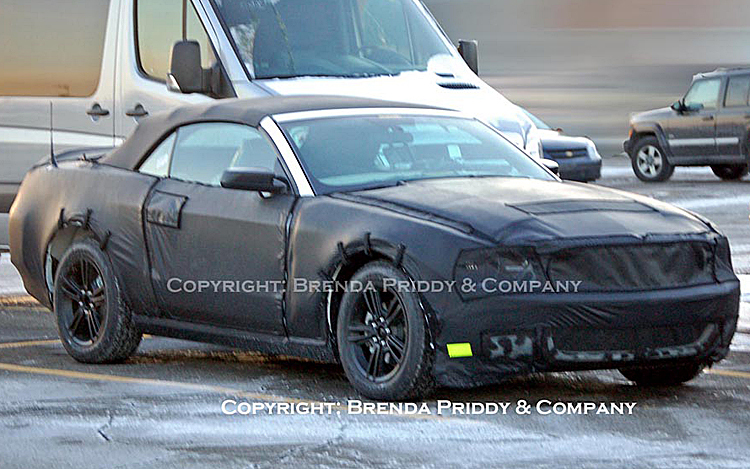 Weitere News sind, dass es mit großer Wahrscheinlichkeit einen neuen 2010 Shelby GT500 geben wird, er soll auf jeden Fall mehr wie 500PS leisten können! DETROIT, Jan. 6, 2008 – Ford Motor Company is introducing a new engine technology called EcoBoost that will deliver up to 20 percent better fuel economy on half a million Ford, Lincoln and Mercury vehicles annually in North America during the next five years. The EcoBoost family of 4-cylinder and 6-cylinder engines features turbocharging and direct injection technology. Compared with more expensive hybrids and diesel engines, EcoBoost builds upon today’s affordable gasoline engine and improves it, providing more customers with a way to improve fuel economy and emissions without compromising driving performance. „EcoBoost is meaningful because it can be applied across a wide variety of engine types in a range of vehicles, from small cars to large trucks – and it’s affordable,“ said Derrick Kuzak, Ford’s group vice president of Global Product Development. „Compared with the current cost of diesel and hybrid technologies, customers can expect to recoup their initial investment in a 4-cylinder EcoBoost engine through fuel savings in approximately 30 months. A diesel will take an average of seven and one-half years, while the cost of a hybrid will take nearly 12 years to recoup – given equivalent miles driven per year and fuel costs,“ he said. Ford will introduce EcoBoost on the new Lincoln MKS flagship in 2009, followed by the Ford Flex and other vehicles. By 2013, Ford will have more than half a million EcoBoost-powered vehicles on the road annually in North America. 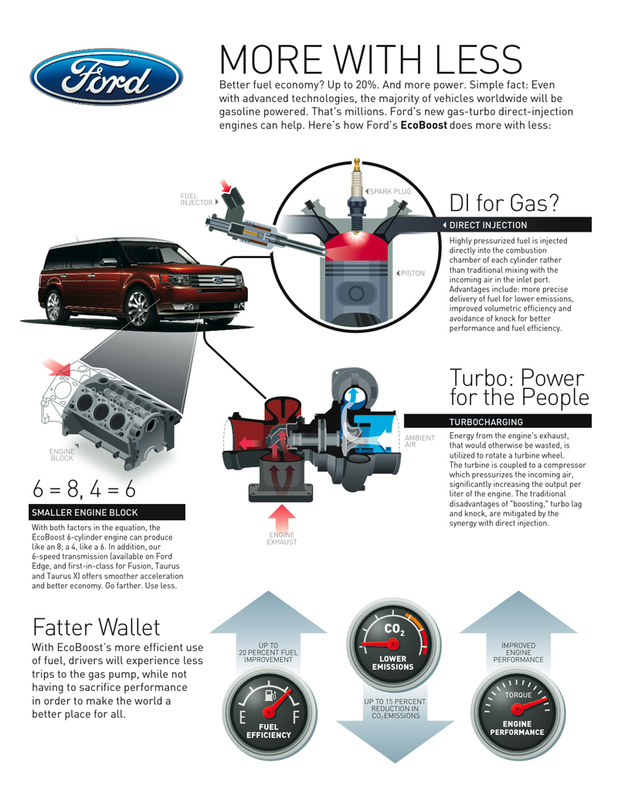 In 2009, Ford first will introduce EcoBoost on the Lincoln MKS featuring a 3.5-liter twin-turbocharged V-6. It will produce the power and torque of a V-8 engine with the fuel efficiency of a V-6. In fact, with an estimated 340-horsepower and more than 340 lb.-ft. of torque, the Lincoln MKS will be the most powerful and fuel-efficient all-wheel-drive luxury sedan in the market. EcoBoost’s combination of direct injection and turbocharging mitigates the traditional disadvantages of downsizing and boosting 4- and 6-cylinder engines, giving customers both superior performance as well as fuel economy. With direct injection, fuel is injected into each cylinder of an engine in small, precise amounts. Compared to conventional port injection, direct injection produces a cooler, denser charge, delivering higher fuel economy and performance. When combined with modern-day turbocharging – which uses waste energy from the exhaust gas to drive the turbine – direct injection provides the best of both worlds: the responsiveness of a larger-displacement engine with fewer trips to the gas pump. Ford’s 3.5-liter EcoBoost V-6, for example, can deliver upwards of 340-plus lb.-ft. of torque across a wide engine range – 2,000 to 5,000 rpm versus 270 to 310 lb.-ft of torque for a conventional naturally aspirated 4.6-liter V-8 over the same speed range. At the same time, this V-6 gives customers an approximate 2 mpg improvement and emits up to 15 percent fewer CO2 emissions to the environment. Direct injection coupled with turbocharging allows for the downsizing of engines that deliver improved torque and performance. A small 4-cylinder EcoBoost engine has the capability of producing more torque than a larger 4-cylinder engine – nearly an entire liter larger in displacement – with better fuel efficiency. The real-world fuel economy benefit is consistent no matter the drive cycle, meaning the engine is efficient in the city as well as on the highway – unlike hybrids, which are most efficient in stop-and-go traffic. In addition, customers who tow and haul – and have long turned to more expensive diesel powertrains for their superior towing capabilities – can find the engine performance they need from an EcoBoost powertrain. EcoBoost – combined with multi-speed transmissions, advanced electric power steering, weight reductions and aerodynamic improvements – is part of Ford Motor Company’s strategy to deliver sustainable, quality vehicles that customers want and value. Additional hybrid offerings and diesel engines are planned for light-duty vehicles. Longer term, Ford plans to remain aggressive in the development of plug-in hybrids and hydrogen fuel cell-powered vehicles.